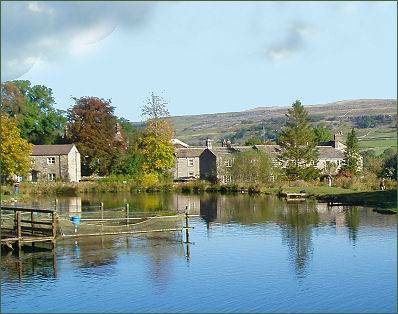 The village of Kilnsey is situated in spectacular Wharfedale, and lies on the B6160 road, between the market town of Grassington and the village of Kettlewell, and just across the River Wharfe from Conistone. 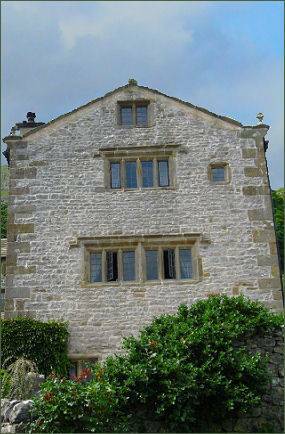 The Kilnsey Estate was first mentioned in the Domesday Book of 1086, when its owner was recorded as 'Ulf'. In 1155 a vast tract of land including Kilnsey was gifted to the monks of Fountains Abbey by Alice de Romillie, the heiress to Skipton Castle. The monks controlled and farmed the Estate for nearly 400 years. The Old Hall in Kilnsey, (pictured right) a Grade II listed building, was an administrative site for wool trade. Most of the present building, well restored, dates from 1658. Kilnsey has one pub, the Tennant Arms, which offers accommodation and serves good home cooked food. There is also a trout farm, and a small collection of houses. The Kilnsey Park Estate has a large fishing pond and area for pony trekking. It also has a conservation programme for red squirrels, which are rapidly becoming extinct in many areas of the country due to competition from grey squirels. The red squirrels at the park are part of a captive breeding scheme devised to prevent them becoming extinct. The surrounding hillsides are rich in prehistoric remains and a paradise for archaeologists. West from Kilnsey towards Malham Tarn runs the historic Mastiles Lane, a Roman marching road, later an important drovers' way for Fountains Abbey flocks to summer pasture on higher ground, approximately five miles distant. This is now a Dales walking track. Every year the village hosts the Kilnsey Show, which is regarded as the Dales' premier agricultural gathering. It includes harness racing, fell running, equestrian events and dry stone walling. There are also stalls selling produce and crafts from local farms. 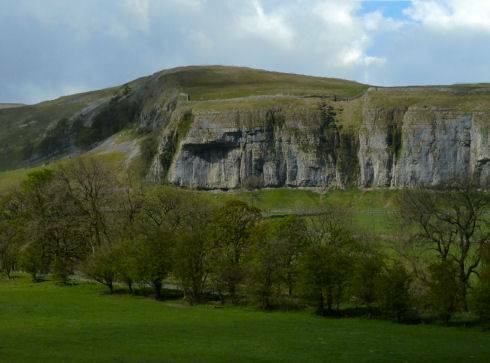 The most notable feature of Kilnsey is the dramatic limestone cliff of Kilnsey Crag, which dominates the western skyline, overlooking the road and the River Wharfe from the west. The Crag rises to around 170 feet high, with an overhang of 40 feet. It is noted as 'one of the finest limestone escarpments in the country' and 'a puzzle to geologists'. The landscape artist Turner visited Kilnsey Crag on his tour of Yorkshire in 1816, he spent the night of 25 July at nearby Kettlewell and devoted the next morning to exploring Kilnsey Crag. During his tour, he made a series of quick sketches recording views from the road to the north and south in a small pocketbook. Old Nan, a local woman, was rumoured to be witch who lived under Kilnsey Crag during the 1700s and used to tell fortunes. She was known as far as Skipton, where she had a stand in the market.